A slightly amusing story in yesterday’s Bild caught our attention this morning concerning a growing row over the seating arrangements in the Nordrhein-Westfalen regional parliament (Landtag) which has to be re-thought following the recent elections. 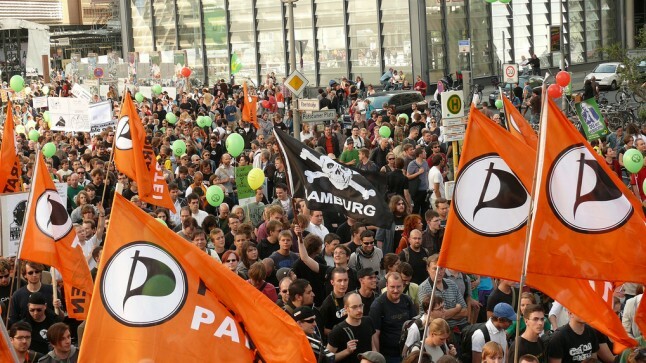 Namely the far-Left Die Linke were wiped out, while the pirate party continued its recent hot streak and won seats in NRW for the very first time with 7.8% of the vote. The other parties want a straight swap with the pirates taking over Die Linke’s old seats on the far left of the chamber, but the Pirates are outraged by this proposal, demanding instead to be sat in the middle, between the governing and remaining opposition parties. Ostensibly of no great significance, this spat does however illustrate a wider point in German politics: the difficulty for the country's political structure to come to terms with alternatives to the traditional parties. Although, to be fair, classifying and categorising the pirate party, particularly using the traditional left-right labels, isn't easy. 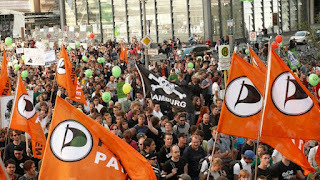 For example, polling has shown that it has garnered support from across the political spectrum from the Christian Democrats through to Die Linke. Unsurprisingly, this is reflected in their manifesto, which combines strongly libertarian aspects (e.g. on civil liberties) with more traditionally social-democratic policies (e.g. on universal child care). While there are some interesting parallels with UKIP (e.g. on drug policy), overall the Pirates are pro-EU membership, in particular aspects such as free movement. However, as we have pointed out before, they have been highly critical of the eurozone bailouts, and this could have been a significant factor in their recent rise.